Some of the most significant evidence and testimony used to convict their clients of illegally routing millions of dollars to Hamas never should have been allowed, attorneys for former Holy Land Foundation (HLF) officials argue in a series of appellate briefs filed late Tuesday. U.S. District Judge Jorge Solis should not have allowed two Israeli security officers to testify anonymously, should have rejected exhibits that detail HLF's role in a Hamas-support network in America as hearsay and should not have allowed jurors to see chilling images from Hamas terrorist attacks, briefs submitted to the Fifth Circuit Court of Appeals argue. 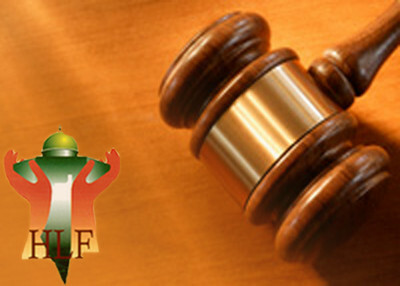 HLF and five former officials were convicted on 108 counts related to their support for Hamas through a series of Palestinian charities known as zakat committees. Prosecutors argued the defendants knew those charities were controlled by Hamas and used the exhibits and testimony to prove it. It is considered the largest terror-financing prosecution by the United States. While each filed a separate brief, the defendants adopted each other's arguments while pointing out problems specific to them individually. One appeal, for former HLF chief executive Shukri Abu Baker, was identified as classified and was hand delivered to the court. Classified materials were an issue before the trial, but none was presented to jurors. Ghassan Elashi, who also was convicted in 2005 of conspiring to send money to a relative who is a Hamas leader, argued the HLF case amounted to double jeopardy. And an appeal on behalf of the foundation itself said the trial should be invalidated because, while the defendants were represented, HLF had no counsel. The convictions came after a mistrial in the first prosecution of the case. HLF's counsel, Nancy Hollander, told the court during jury selection of the first trial that her firm could not represent Baker and HLF at once and was withdrawing from representing HLF. No replacement counsel was named. But no paperwork was filed documenting the withdrawal and Hollander remained on the court docket as HLF's representative. After the mistrial, Solis replaced Judge A. Joe Fish as the presiding judge. The issue of HLF's representation never came up. Alerted to the issue earlier this year, Solis blasted Hollander for "complete lack of candor and a failure to diligently inform the court of a material fact." He found HLF had "de facto" representation at the trial and allowed a new attorney to represent it on appeal. In the latest briefs, defense attorneys focused most intensely on the testimony of the two Israeli officials. Identified only as "Avi" and "Major Lior," the trial court allowed their testimonies even though their true identities were considered classified. Defense attorneys did not know their real names or have any access to information about their educational and professional histories. This severely crimped their ability to cross examine the men, the defense argues and "reflects a fundamental misunderstanding of the constitution and the adversarial system." Avi explained connections between zakat committees HLF supported and Hamas. Major Lior described how Israel obtained records from the Palestinian Authority during a 2002 military incursion into the West Bank. "This case marks the first time any American court has allowed a prosecution expert to testify without disclosing his name at least to defense counsel, and one of only a handful of occasions when any prosecution witness has been permitted to testify without disclosing his identity to the defense," wrote defense attorney John Cline. Judge Solis later admitted into evidence three Palestinian Authority exhibits, one of which identified HLF as a Hamas financier and another of which detailed zakat committee ties to Hamas. Those exhibits had been rejected as hearsay in the 2007 mistrial. Between trials, however, the Palestinian Authority shut down the zakat committees, saying they were tied to Hamas. Prosecutors argued the move validated the evidence because the PA's actions closing the committees last December was "an effort to take control of the Hamas social infrastructure. Hamas correctly interpreted the PA measures as an attack on its charitable institutions." Similarly, internal records from members of the "Palestine Committee" should have been rejected as hearsay, the defense attorneys argue. Those records, taken from Hamas activists Abdelhaleem Ashqar and Ismail Elbarasse – an aide to Hamas deputy political chief Mousa Abu Marzook – identify the Palestine Committee as a Muslim Brotherhood creation to help Hamas politically and financially. But the documents precede the United States' 1995 designation of Hamas as a terrorist group, attorneys argue, so they could not have been made in furtherance of a conspiracy. And there's no evidence that the defendants ever saw them, according to the defense. In addition, defense counsel argue, videotapes and pictures from the aftermath of Hamas attacks, or of programs showing Palestinian children dressed as Hamas terrorists or wearing faux suicide vests should have been kept from jurors because they are more prejudicial than informative. All the defendants remain in custody pending their appeals. In their quest to conquer America for Islam, this enemy has figured out hwo to use our JUST system of laws to enable them to overthrow it.. the irony is that if we already had sharia law here,, they would have been KILLED for being TRAITORS! Ok, how bad is this, guys? Have any legal experts here gone through it and weighed in on the merits of their arguments? If this whole thing fall apart, the reverberations will be felt far and wide, and will significantly tie our hands in our attempts to squeeze off funding for Hamas, etc.